Tour operator flights to Lesvos can return to pre-migrant crisis levels, according to travel agencies, members of the Tourist Board of Molyvos, that transport guests with charter flights from Europe to the Greek island. The destination is expected to reach 55,000 arrivals from Europe this year compared to 43,756 last year, but it is still far from the record 75,613 arrivals in 2015. "In this time of change, the standards of the tourism industry are evolving rapidly on an international level. Stakeholders in the tourism industry are constantly seeking new alternatives to accommodate visitors’ interests. The very identity of a traveller has evolved from being a simple tourist into becoming an explorer of history, art and nature. The “Tourism association of molyvos” has undertaken precisely this responsibility: to improve the existing tourism structures of molyvos and of its surrounding region and to highlight the environmental and cultural resources of its unique surroundings. By doing so, we aim to offer our visitors monumental holidays and furthermore reset the economic potential of Molyvos. Lesvos is for travelers who want to experience and participate rather than to merely passively enjoy the typical, canned, artificial sameness of a tourist destination. Molyvos and its surroundings is a place where visitors can rest and relax and enjoy the natural beauty of the area and experience the calm associated with the sun setting over the Aegean; a place to hike, climb, or bike through the lush pine forests and acres upon acres of olive groves; swim, sail and fish or scuba dive in the blue waters of the aegean; unwind their minds, de-stress and get in touch with their inner self and the spirituality and energy of the island; attend folk festivals celebrating the island’s heritage and visit museums and monuments and learn about the island’s long history and deep culture dating back over three thousand years; visit ouzo distilleries, harvest olives with the locals, and savor the aroma of Greek coffee brewed over cinders in a “kafeneio” (traditional coffee house) listening to stories of the island’s past and present woven by village elders. Year after year, our many friends travel from around the world to experience again the authenticity and explosion of sensations Lesvos, and the Greece you only think you know, have to offer. We hope to see you among them." 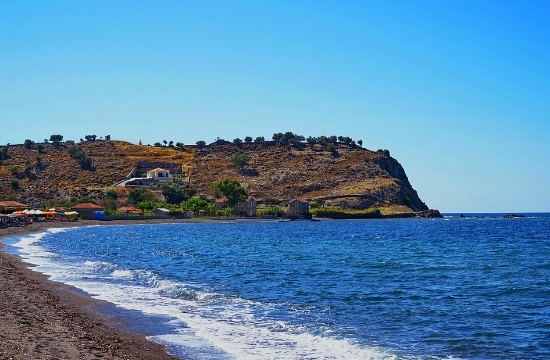 The Tourism Association of Molyvos has also planned a communications strategy which aims to recapture tourism growth on the island of Lesvos. Taking into account local and regional dynamics, as they have evolved during and following the 2015 refugee crisis, Lesvos: After all, it’s still the Aegean, the Molyvos/Lesvos II project, proposes a communications strategy to reposition the region and, more generally, Lesvos in targeted tourist source-markets. Prior work on branding, positioning and vertical markets is the basis of the communications strategy, which details the message map and the associated channels of communication, aimed at increasing tourism by raising awareness and influencing perceptions among likely travelers. Sponsored by Dan and Helen Lindsay, who were also the major sponsors of the work done in 2012, the Molyvos/Lesvos II project manifests experiential learning at its best in American College of Thessaloniki - ACT's graduate programs. As part of an advanced marketing course in the MBA program, the project was completed by an ACT MBA select team, Maria Giokarini and Ioanna-Maria Nella, led by Marketing professor Mr. Mousiades and coordinated by Dr. Sevasti Kessapidou, Associate Dean of Academic Affairs. Acknowledging the school’s significant contribution in the concerted effort to impact tourism growth in the region, Nikos Molvalis, President of Tourism Association of Molyvos, extended an award to ACT.